EIA Global (Export Insurance Agency), of Walpole, MA is very proud to announce that we have moved! After 30 years in our old location at 40 Front Street, we have found ourselves a new expansive home. 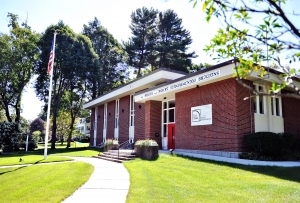 Our new location is the old Walpole Public Library. We converted the historic building to our office space, while trying to preserve the library “feel”. We have spent the last 18 months reconstructing the old Walpole Library to meet our needs. The exterior structure and façade of the building was maintained, while the interior became a major renovation although keeping many of the original features of the old library. On September 29, 2014 we moved into 65 Common Street and opened our doors as EIA Global’s World Headquarters. The original 1903 structure was gifted to the Town of Walpole by Andrew Carnegie – a Scottish emigrant to the U.S. – who was a very well-known businessman and philanthropist of his time. Andrew Carnegie came to the United States with his very poor parents in 1848.Carnegie started his career as a telegrapher and by the 1860s had investments in railroads, railroad sleeping cars, bridges and oil derricks. He managed to advance rapidly in the railroad industry, making key investments and eventually earning a vast fortune. However, he strongly believed in large-scale philanthropy and gave away approximately 90% of his own wealth by the time he died in 1919. Carnegie was personally invested in the proliferation of books and libraries because of his own early life reading experience from a personal collection of 400 books made available to him by Colonel James Anderson. 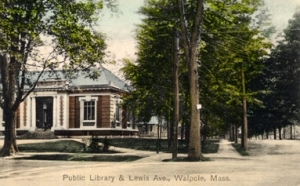 Library groups had spread throughout the USA in the post-Civil War period largely due to the organization of Women’s groups – such as the one which existed in Walpole. A total of 2,509 “Carnegie” libraries were built throughout the USA, Great Britain, Ireland, Canada, Australia, New Zealand, Serbia, the Caribbean, Mauritius and Fiji between 1883 and 1929. 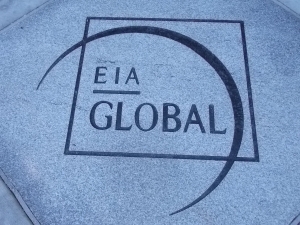 EIA Global welcomes 2015 with renewed vitality and looks forward to many successful years at their new home office.